A single firework popped above a group of over 200 students marching downtown. Red sparks rained down as students from various universities across Montreal continued to demand remuneration for internships. 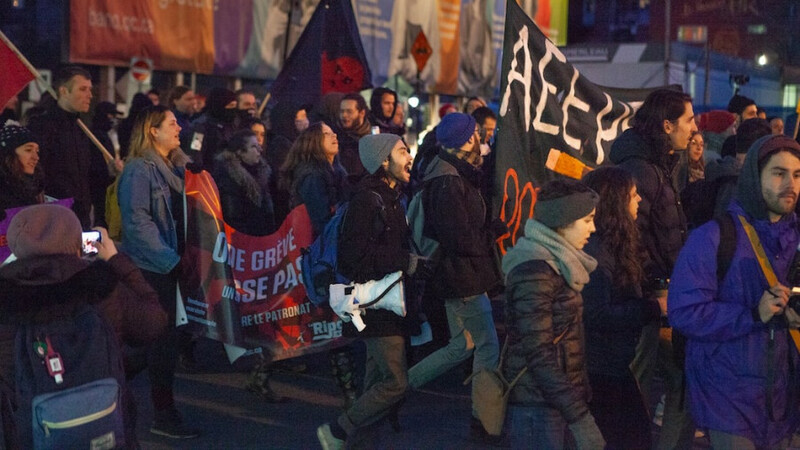 Student organizations from varying departments in universities around Quebec have been mobilizing since November, with approximately 35,000 students on strike this week. “We just don’t see why us in the care domain are forced to go out in the street [and strike] to get what is due for us,” said Laurence Blanchard, who studies social work at Université de Montréal. “It’s flat out injustice,” she continued. The march started at the corner of St. Catherine St. and Berri St. 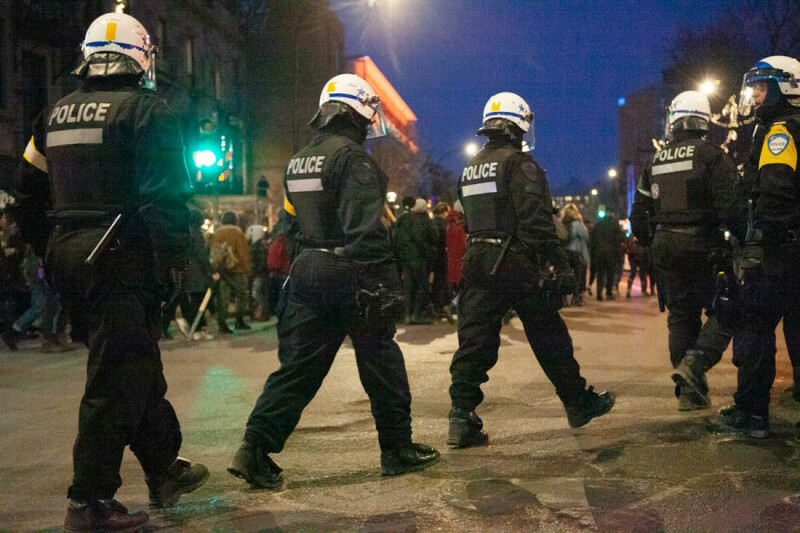 The group then made its way north on Berri St.
At around 7:40 p.m. the march was met by police in riot gear at the corner of Berri St. and Cherrier St., some of who brandished large riot gun with rubber bullets. As riot police marched alongside the crowd, resounding boo’s echoed among students. Police also engaged with some of the participants, pushing them out of the way. Some protestors wore bandanas around their faces with “stagière en colère” written across them. Chants such as, “On veut notre argent, c’est printemps” and “L’exploitation n’est pas une vocation” echoed throughout the march. “A strike is a viable tactic because it doesn’t just make a lot of noise and a lot of news, but it also puts real, direct pressure on the universities and on the government,” said John Hutton, the finance coordinator for the Concordia Student Union. Hutton stressed that universities tend to give students what they request to reduce failing grades from lack of attendance and class cancellations. “The more people that are on strike, the bigger the pressure,” he continued. The demonstration looped back around Place Émilie-Gamelin as chants began to fade, followed by the strum of an acoustic guitar. 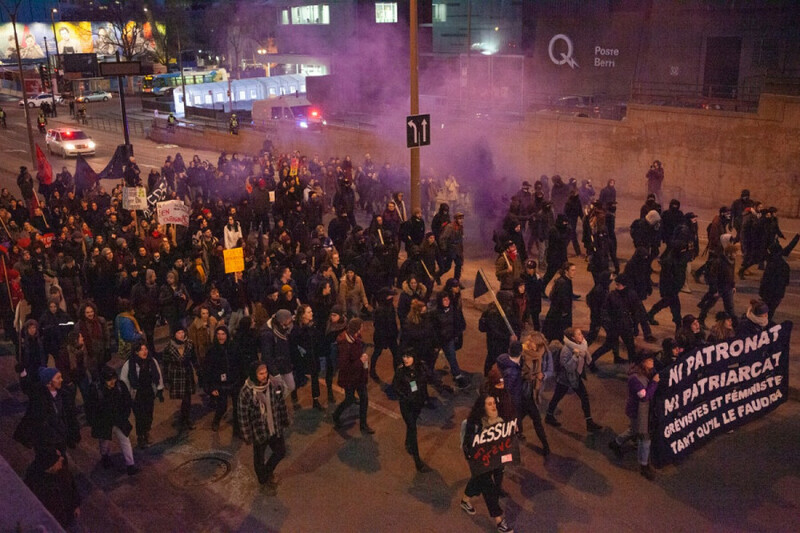 After the end of march, students went into Université de Québec à Montréal to celebrate the closing of the demonstration. Students will continue to mobilize this week with another protest on Thursday afternoon, with the provincial budget to be announced the same day. Interns were hoping funds would be allocated to pay intern salaries, though Education Minister Jean-François Roberge told Journal de Québec that won’t be happening.